When Rich Hill was healthy in 2016, he was fantastic. He pitched to a 2.12 ERA, struck out 129, and walked just 33. The problem, as always, with Hill was his health – he made just 20 starts and pitched 110 2/3 innings. He’s topped those marks just once in his career, way back in 2007 when he was a 27-year old future star with the Chicago Cubs. None of that mattered to the Los Angeles Dodgers, who agreed to re-sign Hill for the next three seasons at a total cost of $48 million. Hill isn’t that potential-laden future star anymore. He’s 36 (37 in March) and is in the midst of a career renaissance spurred by a brilliant four starts in September for the Red Sox last year. The Dodgers are banking on him to stay healthy for 20 or so starts a year to fill out their rotation – they’re not expecting him to be a 33 start, 200 inning horse. However, that’s expecting a lot from a guy who has only thrown 40 innings and made ten starts in the majors just twice since 2008. Signing Hill, while significant for Los Angeles, isn’t like signing Zack Greinke. It’s more in the mold of signing Brandon McCarthy, which they did two winters ago. After a rough start to his career with the White Sox and Rangers, McCarthy’s career was reborn in Oakland. He struggled over a year and a half with the Diamondbacks, bounced back in the second half of 2014 with the Yankees, and inked a four-year, $48 million contract with the Dodgers before the 2015 season. He’s made just 13 starts over the last two seasons while dealing with a cadre of injuries, including Tommy John surgery. The Dodgers now have one of the most talented, and injury-prone, rotations in baseball. Clayton Kershaw is the best pitcher in baseball when healthy, but he made just 21 starts last season due to a recurring back issue. Scott Kazmir has had plenty of injury issues over the years, which led to him throwing just 136 1/3 innings in 2016 (coincidentally, he also signed a three-year, $48 million contract. Maybe he was the better comp for Hill instead of McCarthy). McCarthy’s been banged up over the last couple of seasons. Hyun-Jin Ryu has made just one start over the past two years, and can’t be counted on in 2017. Even the two Dodgers starters that were healthy in 2016 have questions surrounding them – Julio Urias is insanely talented, but just turned 20 in August and crossed the 100 inning mark for the first time in his pro career last season. Kenta Maeda’s first year in America last season was a rousing success, but he did seem to run out of gas in the second half of the year. Luckily for the Dodgers, they have some depth. Alex Wood, acquire from the Braves in the summer of ’15, is still around and kicking, though health is a question with him. Prospect Jose De Leon is close to major league ready. Brock Stewart and Ross Stripling both made multiple major league starts in 2016 and are still in the organization. 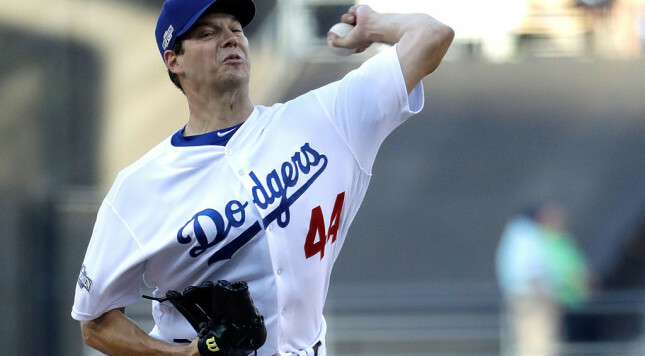 The health of Rich Hill won’t determine whether or not the Dodgers season is a success. But if they can wring more than 20 starts out of him in 2017, the team will be in much better shape than if they have to rely too heavily on their depth.